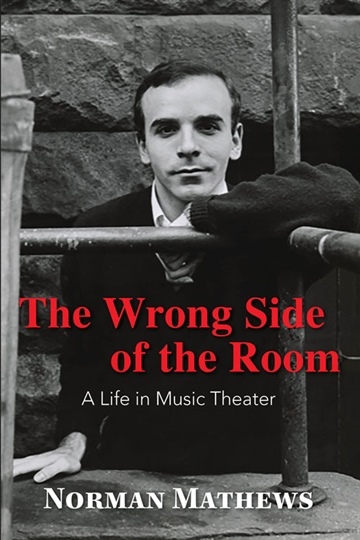 The Wrong Side of the Room: A Life in Music Theater by Norman Mathews is one man’s tale of a harrowing journey to a fulfilling life in both music and theater. Norman Mathews was born in the wrong town, the wrong era, and with the wrong name. What’s a boy to do? He conjured up a more enticing, imaginary world to better navigate the perils of childhood. Dreams of a life in the theater and of passionate romance were stymied by lack of self-assurance. Psychological abuse by a priest led to absurdly comic psychotherapy over his sexuality. At age twenty, a failed suicide nearly shattered a promising future. From the ashes of this calamity rose a staggering resolve to build a meaningful life. Byzantine twists paved the way to a career as a magazine editor and eventually a life as a Broadway and movie dancer. During his performance years, he worked with Barbra Streisand, Dorothy Lamour, Gene Kelly and Michael Bennett. After an untimely injury, he reinvented himself as a pianist, composer, and playwright, for which he created award-winning works for top Broadway and concert-stage performers. His passionate and inspirational autobiography is steeped in dark humor, hilarious celebrity gossip, and backstage intrigue. It is a rare book that can intimately describe a self-destructive trajectory, recount the grisly murder of a former roommate, provide an inside look at the embezzlement of a famed Broadway producer, detail an ugly never-reported rehearsal scene involving Michael Bennett, and give a behind-the-scenes look at the birth of new musicals and operas. Mathews brings his colorful Sicilian-American family, his triumphs and heartbreaks, and his mine-strewn path to fulfilling love vividly to life. Reviewed By Asher Syed for Readers’ FavoriteThe Wrong Side of the Room: A Life in Music Theater by Norman Mathews is an autobiography chronicling the author's life as he transitions from a confusing and often abusive childhood, born in a sleet of uncertainty (literally, as it turns out). Masked by imagination and written with a humor that most would not be able to apply to such situations, Mathews is able to harness this creativity and hitch it to his own ambitions as a rising star. When an injury threatens to derail an ascent that defies all odds, Mathews is forced to reinvent and reignite himself once more, and does so amid a whole host of personal and professional turmoil, scandal, and the kind of stories that are all the more shocking – and inspiring – because they are actually true.Norman Mathews delivers a riveting memoir with The Wrong Side of the Room that opens with a contentious genesis and powerfully surges through to its finale. This is the ultimate tale of a man who is knocked down seven times and gets up eight, except in this case our tenacious narrator is struck to the ground far more than that. But he does continue to rise and appears to have carved out a genuine niche for himself until, “I woke up one morning with a strange pain in my back and running down my right leg. In a few days, it got much worse, and I began limping.” With the support of his partner Todd, he buys a Steinway, dives into formal education, and...well, at first that all implodes too. But Mathews is the consummate phoenix and, much like he displays in the writing of this book, skillfully maneuvers the trajectory of his life's own narrative into a story that we are fortunate enough to have shared in The Wrong Side of the Room.